I had great plans for this post. I even ordered the cute little molds to make roses and leaves. I had planned to get fancy. I have been so sick for the last three weeks. Barely hanging on to be exact. Two weekends in a row trying to "rest and sleep" this beast away. No go! Sometimes life takes over and I have to just say, "oh well". I am heading to the doctor today to get something to help with the cough and hopefully exile this thing from my body. It has really messed up my schedule. (Turns out I had bronchitis and my asthma made it worse...the meds are finally kicking in and working). I was asked to do an interview for a local TV station on Wednesday and was able to muddle through that with the help of a few cold and sinus tablets. This recipe is special to me because it was given to me by a woman I met 25 years ago. I met her through church and as we would sit and visit once a month, she would be busy making these cream cheese mints. Her fingers worked so fast! This is what she would do for the bride and grooms in our area as part of their wedding gift. The mints were always a hit at each wedding reception. How could they not be? Made with love, each one pressed into the mold and then flipped out onto the table. 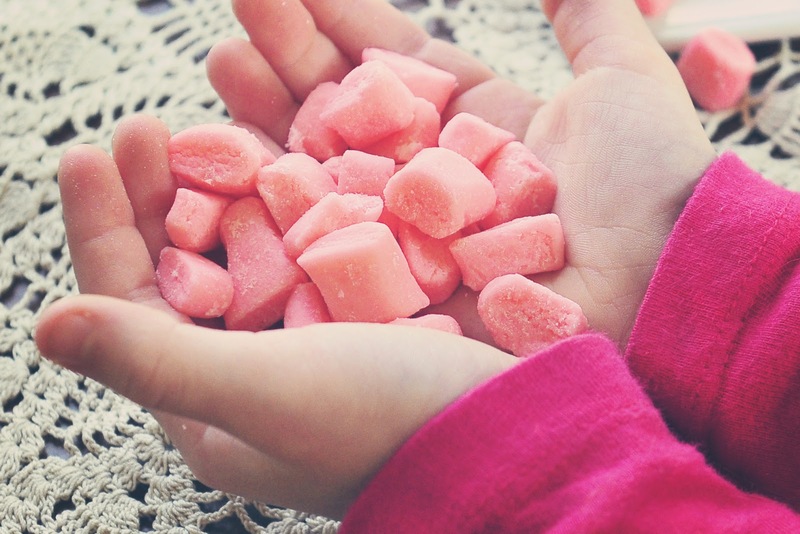 Her home smelled so good on the days that she made the mints---minty fresh and clean! I wrote this recipe down on an old napkin and have kept it this whole time. When our Sunday Supper group was deciding on Valentine Day recipes I knew this is what I wanted to make. You don't go through this much work (referring to the fancy molded mints) for just anybody, you do it for the ones you love. This is my first batch that is pictured and I went the easy route of rolling the dough into long ropes and cutting them into bit size pieces. A practice run you could say. Well, when this bug is all said and done, I will add a few more pictures of the mints in the shapes that I purchased--leaves and roses. Keep in mind that you can make the mints any color or keep them white. This batch I have had sealed in a bag for two months and they taste just as fresh as that first week that I made them. They are buttery, creamy and minty morsels of love. See below the list and recipes of the Sunday Supper group sharing their LOVE with each of us today. Combine cream cheese, confectioner's sugar, extract and food coloring until well blended. The dough should be kneadable (not too sticky). If this happens, add more sugar. Knead dough for 3 minutes. 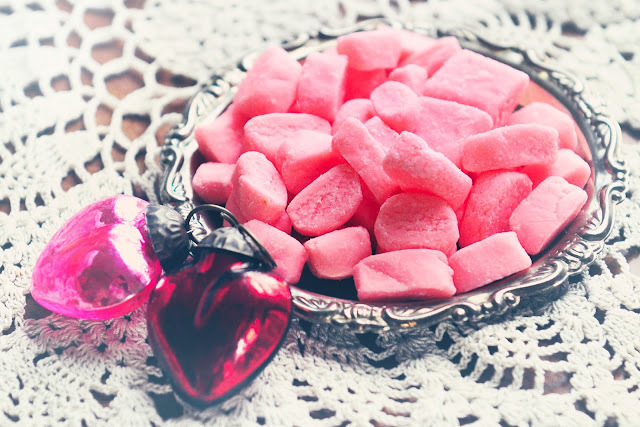 Place in refrigerator for 10 minutes, remove and cut into tiny candy segments. If using the molds: Pinch off a piece of peppermint dough, dip in sugar and press into mold. Gently pop them out and store on a cookie sheet lined with parchment paper. The mints will become harder the longer they sit (7-10 days is recommended). I stored mine in large bags until I was ready to use and share them. Sorry you have been so sick. I just started working at a school part time and my first week I was hit with the sick bug. I hope you are able to kick this bug soon. These mints look wonderful, good job on putting together something even though you were feeling sick. Although they may not be shaped into leaves or roses they are pretty to me. What great color. And cream cheese too. No reason to have a butter mint when you can have cream cheese. How wonderful. What a sweet, simple, recipe. I love it!. Hope you are feeling better soon. Very easy but delicious recipe! Get better soon! 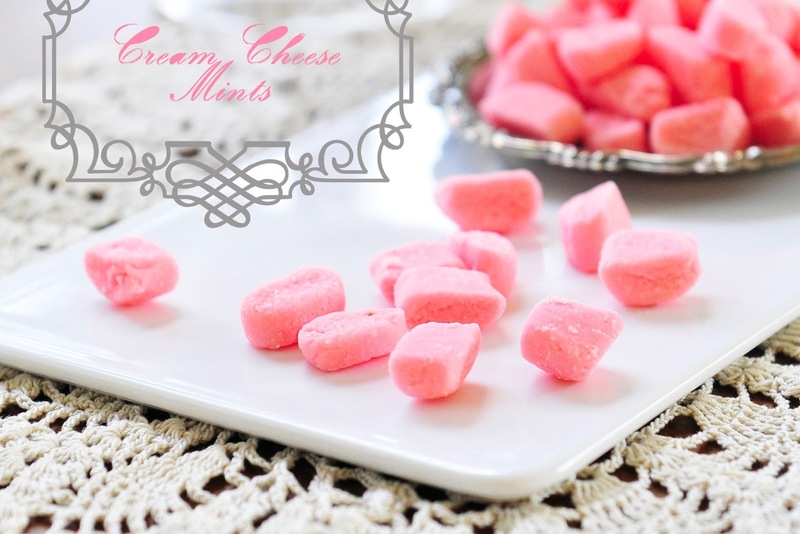 I´ve always wanted to make mints, and I don´t know what´s stopping me since they´re so easy! Get well soon, and eat mints while you do! Hope you are starting to feel better! The mints are so pretty. A friend of mine made them for a cookie exchange and they were so good. She rolled little balls (or maybe she cut logs like you) but then she pressed them a bit with a fork like classic peanut butter cookies, and they were so cute. I love, love, love these kinds of mints! What an awesome recipe! I love this. I cannot wait to make it! I love the backstory behind these mints. Some of the best memories are made around the kitchen table, which is why I'm so glad to be a part of #SundaySupper. I hope you're feeling better soon! OMG, these are lovely. healthy too.I must give these a shot. Mint is my fav flavor for anything !! YAY!! Thank you for this recipe. I love these and have always wanted to make them! I love this! Hope you are feeling better!!! Sherron, that sounds terrible, you poor thing! Thank goodness the meds are kicking in and doing their thing. Love the recipe - these look delish! Never seen anything like this, I would love to give this recipe a try!!! never tried something delicious like this. You are simply awesome. thanks mate.